I took this photo in an effort to capture three police vehicles on the same corner (Franklin and Bergen): the Mobile Command Center, the mounted police truck (with horses in tow), and one of those little "interceptors" that are the TIE fighters to the Skywatch's AT-AT (nerd alert). At the last second, a car pulled into my frame, blocking the interceptor, and I swore under my breath . . . until I realized it was a police cruiser (click the image for a better view). So the NYPD are out in force on Franklin--this isn't news. The street patrols have been beefed up to McGwire-Sosa proportions (the lady counted 8 officers in one 8-block trip from Dean to Eastern the other morning), the Mobile Command Center has been in place for over two weeks, the Skywatch has been crowding the sidewalk into one line at St. John's all summer, and the other day I saw mounted police clop-clopping their way up the Avenue. I don't recommend this test, but I'd put decent money down that if you live on Franklin between Eastern and Atlantic and you walked out your door right now and shouted "POLICE!" as loud as you could, you'd have a uniformed officer at your door in less than five minutes. Me: So, why is the Command Center parked right here? Officer: Do you live around here? Officer: Did you hear about the shootings? Still, the mounties seem like a bit much--there are only 80 police horses (and 112 officers trained to ride them) in the whole city, and you'd think that any given summer day they'd need most of those on duty for crowd control in the parks and at tourist destinations. Their presence made me wonder whether there isn't something else going on with the police on Franklin. Certainly securing the neighborhood is their first priority, but does that really mean throwing the kitchen sink at it? A poster on Brooklynian's Crown Heights board had an interesting insight--the latest Police Academy class is less than two months into their service, and are still getting trained on the job. It seems that the need to test and provide training for new officers would dovetail nicely with a deliberate show of force, so I'm inclined to believe this theory without any hard evidence to back it up. What I'm more curious about is what my neighbors think--I've heard more than one person say "look, I'd prefer there wasn't a police truck on my corner 24-7, but it's a lot better than bullets," and I've also heard a few folks express their frustration at what they consider a police attempt to intimidate them and other residents. On the whole, things have been relatively quiet and several stoops have been noticeably less lively on Franklin since the surge. 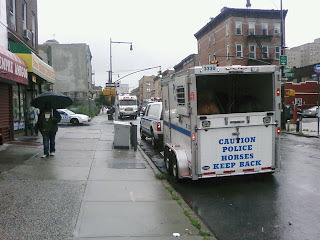 As a final aside, I found it somewhat interesting that I can't pull up an official description of the Mobile Command Center with Google (though I could buy one, which would be right up there with my usual ideas for wowing the lady), but I can find a seven-minute official video about NYC's mounted police. For anyone who missed it (I'm among this group), here's a video of the new anti-gun violence mural that the Crown Heights Community Mediation Center unveiled on Saturday. Congratulations and thanks to all those who participated in beautifying our community -- may your work inspire others to seek constructive pursuits and leave their weapons behind. This was supposed to run on Tuesday, but ongoing technical issues delayed it until today. Enjoy! Today was a rare treat--I got to spend two precious hours immersed in another century, surrounded by the scents, tastes, and textures of fresh produce and immersed in the comings and goings of my neighbors. In a squat brick building no more than 30' x 20', I played being a farmhand, a grocer, and a tavern-keeper, all while snacking on indescribably succulent cherry tomatoes and crispy green beans. It was an unexpected and wholly delightful experience, and I have the Crown Heights CSA to thank for it. First, the facts: the CSA is new to Crown Heights this year, a product of the vision and very hard work of a core group of people who, volunteering their time, have brought the fresh, organic produce of Sang Lee Farms from the North Fork of Long Island to our neighborhood. Aided by the umbrella CSA organization Just Food, our good neighbors began selling shares (lump sums paid up front to the farmer in exchange for a "share" of his harvest every week for nearly six months) at Franklin Park in April, and now a wide swath of Crown Heightsers gather weekly at the bar's storage room to collect their loot. A limited number of subsidized low-income shares were offered, and organizers have sought to raise funds for more in coming years through bake sales and house parties. So the CSA provides over 100 locals of all stripes with fresh, delicious organic vegetables (as well as coffee from Crop to Cup for those who ordered it) while supporting a (relatively) local organic farmer. Good is done, hurrah, hurrah. But now that I've spent a meager 2 hours volunteering to complement my usual 10 minute grub grab, I'm inclined to think that the best the CSA offers isn't captured in the baseline numbers. The tactile joys of fresh, organic food are many--tomatoes that taste less of water than of sugary, ripe flesh, crisp leaves of lettuce dripping wet with the dew they were plucked from, the delicate snarling aroma of a fresh head of cilantro as it pokes out of your bag on the way home--but they could presumably be acquired at a farmer's market, too. What a CSA offers that no other method of urban-produce-gathering can quite compare to (community gardens and urban farms excepted) is community. In the course of 120 minutes, led by a brusque, no-nonsense volunteer squad captain so adept at pre-measuring a pound of tomatoes that she barely needs a scale, I saw people young, old of all hues and incomes saunter into our dark little cave. 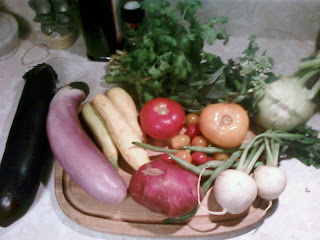 They went goggle-eyed over the two pounds of tomatoes on offer, whined about the abundance of kohlrabi (a German turnip-cabbage that often sits in my fridge until I try to munch it raw out of guilt), and picked merrily through the cute little yellow squashes. More importantly, they talked--chatted about recipes (apparently there are ways to make kohlrabi taste good! ), exchanged produce nightmares (rotting apples, worm surprises), joked about their kids (some of whom toddled in with them and made much of the funnier-looking eggplants), and clucked about the slings and arrows the week had brought them. They thanked us for pre-weighing the potatoes, sniffed the herbs, and joked with our gregarious leader about anything that came to mind. People left with nearly 10 pounds of incomparable produce (for a full share), but they also left with a smile, a sense of welcome and belonging that lingers even past the satisfaction of a perfect, healthy meal. I love the frenetic, vibrant nature of the urban environment, and I'm not about strike out for a clear patch of land to call my own (I've got no illusions about the "simple joys" of farm living--it's work like any other to coax edible food from the earth). Still, you can't have it all, and a city as large as ours can produce alienation and anonymity as readily as freedom and autonomy. In the absence of a single church or union hall where everyone from the neighborhood goes to mingle, the CSA is a mighty fine way to keep the loneliness at bay along with the belly full. Food brings people together everywhere--many thanks to the CSA leaders for bring it to us! As a site note, don't forget to check out all the great Crown Heights events today, from Sue Rock's BBQ to the Flea Market to the Anti-Gun-Violence Mural Dedication. Sue Rock Originals is calling for volunteers to come by and help us prepare for our newest addition - a beautiful new window for our studio. We need your help to remove the front layer (pictured above) and make sure everything turns out GREAT!!! Bring your comfortable clothes, your screwdriver and your healthy appetite cause the BARBECUE IS ON!!! Volunteers should be able bodied and be ready to assist in the removal of screwed in wood siding from the front of a storefront. We will need people to carry wood to the side, bundle wood for recycle, pick up screws, unscrew bolts, hold ladders, smile appreciatively, watch the barbecue pit, pour drinks and have a GREAT time! We are located at 1069 Bergen Street between Nostrand and Rogers Avenues. You can reach us by the A/C trains to Nostrand Avenue in Brooklyn. 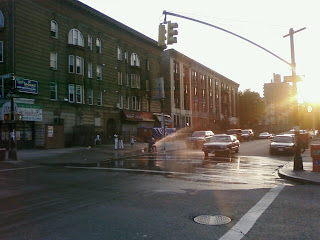 Then walk five short blocks up Nostrand Avenue to Bergen Street. 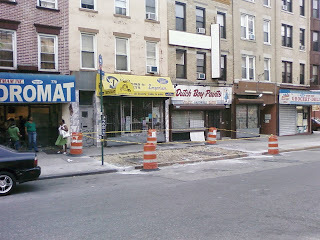 Turn right at Bergen Street.. Our phone number is 347 365 8747. Sue Rock Originals Everyone, Inc is the only textile charity committed to supporting the lives of survivors of domestic violence. With such a small percentage of women leaving domestic violence situations nationwide, we felt it was important to provide direct support to these women who have made the courageous first steps towards change. Each year we partner volunteers with donations of unused fabric samples from companies such as Marc Jacobs, Ann Gish (interior design fabrics) and Liz Claiborne. Our volunteers create NEW clothing and accessories domestic violence survivors will need as they live in in the residence. Women leaving the cycle of violence only have the clothes on their back. Volunteers create sweaters, shrugs, bags, tops and so much more! 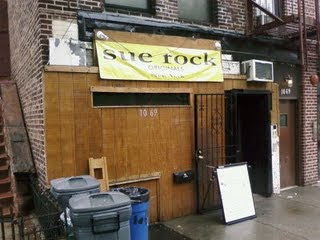 Director, Sue Rock Originals Everyone, Inc. 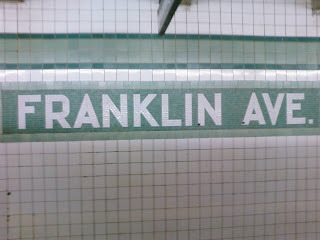 I Love Franklin Ave is not good at golf. Not even remotely. Shot an average of 7 on a par-3 pitch-and-putt on vacation, and swore off the sport forever. However, that doesn't mean I can't hit the links now that I'm back. - Local Councilwoman Tish James (District 35) wants the MTA to commemorate Michael Jackson at the Hoyt-Schermerhorn station where he shot the Scorcese-directed "Bad" video, with suggestions (not all hers) ranging from a plaque (which the MTA apparently prohibits) to an addition to the station name (Hoyt-Schermerhorn-Jackson, which is a little unwieldly). This story has made the rounds already, mostly as a "what will they think of next" or "politicians grabbing for ideas and attention" story, but I think it's actually a brilliant idea. The station, after all, has two unused platforms, which is probably how they got a permit to shoot there in the first place. Forget a silly little plaque or a clunky name change--let's dress those abandoned platforms up MoMA Atlantic-Pacific style! You could put up some temporary statues in mid-dance-move, set up lights, run the video on big screens, put up stills from the video, whatever . . . but people would come to see this, many more than went to see a bunch of oversize MoMA gift shop posters! It wouldn't have to be something you could access, just something seen from the occupied platforms, with some labels explaining the history and what's going on. Done right, it could be a great draw for downtown Brooklyn, which happens to house the MTA's flagship Transit Museum. Ms. James, I salute you, it's a great idea, and I will happily sign a petition to make something interesting happen at Hoyt-Schermerhorn. - RIP to Stanley Kaplan, the Brooklyn-born test prep mogul who turned his own rejection from med school (on grounds of being a publicly-educated Jew in WASP-dominated higher-ed) into a test prep business that blasted the SAT (designed as an "inherent aptitude" test by WASPs who were being "outstudied" by their Jewish competitors and realized it was getting unseemly to keep them out of colleges with quotas) to smithereens. - On a down note, a good piece about the frustrations that follow a shooting in Crown Heights (this one a little further from home, but it's all connected). Since I've been back, the Brooklyn Patrol Borough North Mobile Command Center has been sitting at Franklin and Bergen, and along with beefed-up street patrols (I saw 8 officers on foot on my way up Franklin to Eastern the other day) and the Skywatch, things seem very quiet. - Ending on a up note, Crown Heights' most unlikely rapper has a new album out that's winning some praise. I Love Franklin Ave will be on vacation from Friday 8/14 through Sunday 8/23, but the fun in the neighborhood never stops, so keep your eyes on Nostrand Park for all the latest. I heard through the Crown Heights CSA grapevine that one of their star bloggers will be staffing a table at a health fair of sorts on Park between Nostrand and New York this Saturday, so stop by (after you hit up the Franklin Flea, of course) to learn about the CSA's growing membership and how to get involved this year and next, as well as to chat all things Crown Heights with one of the neighborhood's most diligent and creative bloggers. - Kyle Huebbe of Crown Heights won the Brooklyn Paper's 1st Annual Burger Bash contest in true Brooklyn style, keeping things simple and old-school with a "80-percent ground beef, 20-percent fat patty, seasoned with Kosher salt and pepper and cooked perfectly in a cast-iron pan, topped with a garden tomato (not store-bought! ), cheddar and a horseradish sauce, and piled onto a Portuguese muffin." Said the judges: "Its simplicity was its elegance." As the victor, Mr. Huebbe will get to return to the grill for the New York Food and Wine Festival in DUMBO this fall. Well done, sir, well done indeed. - The great work continues at the Crown Heights Community Mediation Center, whose anti-gun violence mural project at Brooklyn Avenue and Prospect Place caught the eye of the Daily Eagle. There's no need to explain the value of such a project to those who live in the neighborhood, and it's something everyone can get behind. The final dedication and unveilling will be on August 29th. Now this is a joke waiting to be told. 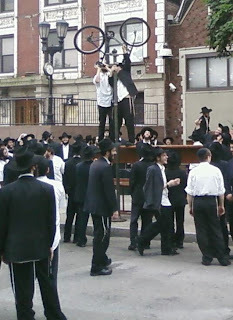 Normally, a crowd of Lubavitch Jews gathered in front of 770 Eastern Parkway is nothing to blog home about, but I did a double-take when I saw that several of them were standing on benches holding something above their heads. An ancient rite? A triumphant celebration? The realization that the object was a bicycle deterred these thoughts slightly (maybe one of their own had just completed a round-the-world bike tour? ), but the secular nature of the object made me bold enough to ask the guy standing next to me what was going on. As he put it "We're trying to take a picture, and we don't want that bike in it, so [motions over his head] shoom, shoom." So there you have it--some unwitting cyclist locked their bike to the pole in front of Chabad World Headquarters, and soon the hapless two-wheeled machine was a good 10 feet in the air, though hanging on quite securely by a lock that didn't look as though it was going to fit over the ornamental knob at the top. 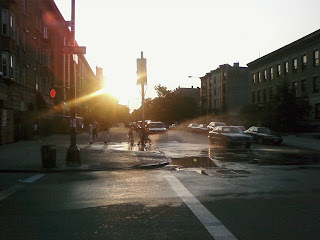 Hopefully the Crown Heights Picture Blog will have more photos later in the day. 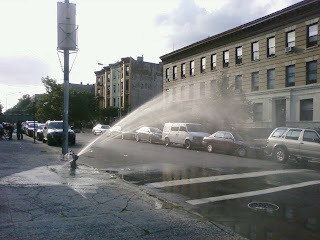 The heat of summer is here, and the hydrants are open. I took some photos last night too, but I think this one is superior. One of my favorite Brooklyn photos of all time captures the joy of frolicking in a fire hydrant: Eugene Richards' Brooklyn, 1993. There's a tiny copy here, but you can see a beautiful complete version (the first link is cropped slightly) at his website if you scroll through the galleries (which is well worth the time). In other news, the lady spoke to Tony Fisher at his supermarket today, and he confirmed that work has begun on the new coffee shop he's building adjacent to Fisher's. He added that he hopes to open in mid-September, and that he's welcoming applications from any once and future baristas (I proudly count myself amongst the ranks) who need a paying gig in the area. A quick note, before I forget: the Crown Heights CSA is holding another bake sale to subsidize low-income shares for this and future years today. In other words, tasty treats for a good cause will be available to complement happy hour at Franklin Park from roughly 4-8pm. Check it out! It was another eventful weekend on Franklin, though not as originally planned by residents. On Saturday, eight days after someone opened fire on Franklin and Dean and seriously wounded a delivery man from Sushi Tatsu II, several rounds were fired on people mingling in the crowd outside of B&B Sports Club between St. Mark's and Bergen, a little over a block away. The Brooklynian Crown Heights message board has been awash with chatter over the latest incident (three victims were hit, but their medical conditions remain unknown) and the recent series of shootings in the vicinity. 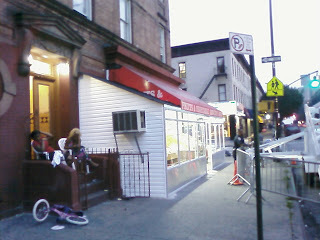 Theories proposed include the effects of the economic downturn and the historic summer spike in crime, but poster Mister Softee was most convincing, using links to local crime statistics and the NYTimes homicide map to demonstrate that the bounce in murders is concentrated in northwest Crown Heights. The party was planned for Saturday, but didn't go ahead without the closure permit. Rodney Duncan of the Dean Street Block Assn. said he felt frustrated, and discriminated against, by the police department's decision. "We applied for our permit in March, but they didn't tell us it had been declined until the last week of July. The DJ's had been paid. We're out money," he said. The police position that there had been too much violent crime in the neighborhood rang hollow to Duncan. "Other streets in this neighborhood have had parties this summer," he said. The Franklin Flea Market at Franklin and Sterling had a successful run on July 12. 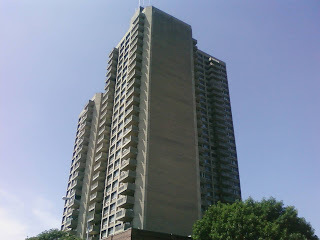 Duncan and residents of his block between Franklin and Bedford Avenues say they feel isolated and singled out. Crime in the neighborhood has fallen precipitously in the last year. The 77th Precinct's most recent CompStat numbers show a 35.7 percent drop in homicides over the same period last year, from 14 to nine. The numbers also show a 26 percent drop in robberies and a 32 percent drop in grand larceny. "We're a block of good, working-class people. Just because some knucklehead with a bad idea and gun shoots someone around the corner, we lose our permit?" he asked. "We have a very successful track record of running block parties," Duncan said. He understands that any public event comes with risks. But the decision doesn't reflect the value of public safety. On July 18, Darrien Delk and Vance Rock were gunned down, execution-style, at an unofficial block party a few streets over at Washington Avenue and St. John's place while sitting in a car. Duncan asserts gun violence doesn't explain the decision to deny Dean Street a permit. He says it might be political. "Our block is currently involved in a class-action lawsuit against the city," he explained. Residents have filed suit in protest of city hall's plan to bring a homeless intake center to the Atlantic Armory around the corner at Bedford and Atlantic Avenue. "I don't know if this is retaliation for the lawsuit," Duncan said, "but their other reasons don't make sense." The block association has a cordial relationship with the 77th Precinct's community affairs officers, and do not believe that the decision came from the precinct, which is all the more puzzling for residents. Detectives with the 77th Precinct's community affairs department declined to comment. Even if the armory suit had nothing to do with this (and I'm not guessing either way), it's a problem from hell. The police certainly don't want a block party to devolve into a shootout, and if they honestly believed that they couldn't keep the area safe, they made the right call. At the same time, this is a block that already feels ignored and betrayed by city officials who've shown what many residents see as callous disregard for their security and comfort on their own street. If there was a time to go the extra mile to give a block club a safe, enjoyable block party, this was it. The police are doubtless trying to keep residents safe by canceling what they believe would become a dangerous event, but the safety of the locked door is a poor substitute for the freedom from fear that comes with living on a safe street. Residents who are afraid that their neighborhood is being slated for decline by city polices want the police to keep them safe in their free enjoyment of the neighborhood, not just to tell them that it's too dangerous to live the way they want. A number of community groups are preparing events and responses to build a dialogue to counter the violence and the destructive cycle of frustration and alienation it fosters. I'll do my best to help publicize them. Official Unofficial Dean Street Block Party Tomorrow! The Dean Street Block Club (comprised of residents of Dean between Franklin and Bedford) was denied a permit to close the street for their annual block party (the grapevine has it that police are concerned about the recent spate of shootings and the general tendency of block parties to spark violence), but that hasn't stopped them from hosting a stoop/sidewalk party tomorrow from 12-7pm. I'm going to miss it, sadly, but I hope it's a great event. After all the stress of the past month, the smell of good food on the grill and the shouts of children playing sound like the just what the doctor ordered. Check it out if you're in the neighborhood! 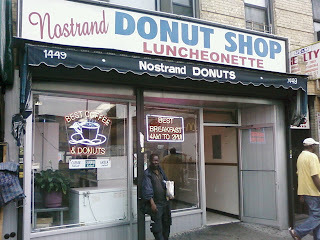 This simple, no-frills donut shop on Nostrand and Church was a great surprise this morning. 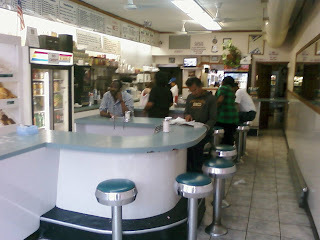 The place is a total throwback, from the sign (as far as I know, nothing established since 1970 has been called a "Luncheonette") to the teal sine-wave linoleum counters and matching chrome-and-cushion bar stools to the snappy, amiable lady in a white apron and matching cap who served me my donuts. When I asked how long they'd been around, she quipped "Longer than you've been alive, that's for sure," and then cackled for a moment before smiling sympathetically. "My husband's owned it for 34 years, and it was here before that . . . maybe 50 years?" The donuts are 80 cents a pop, and the rest of the menu, which I didn't try, is similarly diner-esque and frugal: breakfast plates for $3.50, etc. 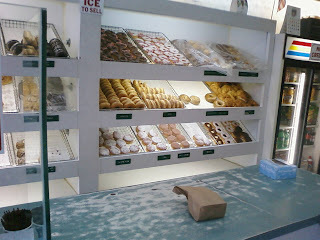 The donuts themselves were fantastic--I ordered a custard creme, which lacked the gooey heaviness of most mass-produced donut fillings and tasted more like actual cream, and a "honey dip," which looked like your standard glazed donut but actual tasted like honey, instead of crusted corn syrup. I could picture this place being absolutely swamped in another neighborhood, but it seems to be off the radar so far: a google search turned up only some minor health-code violations (nothing that made me worry about my donuts) and a solitary positive review from a Californian passing through. It's easy enough off the train (right at the Church stop on the 2-5 line), so go check them out the next time you're craving a homemade donut and some old-timey atmosphere. I was walking home with the lady a couple of days ago when we both did a double-take; a hole in the pavement had replaced the bus shelter in front of our deli. The woman on the stoop next door laughed out loud, and added, "I was looking for it too!" Had an errant bus plowed it over? Had someone made off with it? Nope--it was just an outdated model. Though the city's bus stops aren't covered under cars-for-clunkers, Spanish specialists Cemusa (I thought it was an acronym for something like "Coordinated Entertainment Marketing USA," but I was wrong) have been replacing the city's bus stops and newsstands (and adding public, self-cleaning toilets) since 2006 to great acclaim, according to a study they released earlier this year. To date, they've replaced 1,586 bus shelters, 130 newsstands, and installed two toilets (of a projected 3,300, 300, and 20, respectively). 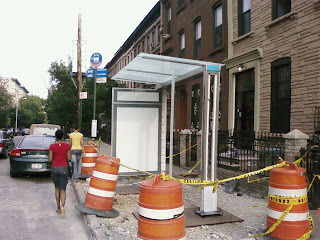 The shelters made some Brooklyn noise earlier this year when they were installed on the threatened B23 bus route in Kensington. The new shelters do look pretty spiffy, though I had no trouble with the old ones and at first my reaction was "does the city really have no better way to spend this money in the midst of a Jolly Green Giant-sized crunch?" However, since Cemusa is actually paying NYC for the right to put up their "street furniture" (sounds like either an Ikea fad or an indie art movement), and (hopefully) employing some locals to do it, I've got no complaints. If anyone succeeds in securing an old shelter to redecorate, let me know--sounds like a good photo. I spend about an hour of every day running, which allows me to explore a sizeable chunk of the borough at a relatively leisurely pace. Frequently, I'll find places on runs that pique my interest, and I'll venture back at a later date with a camera. Some runners despise the stop-and-go of running city streets, but I'd argue that there's no better way to see them. Sometimes a run will take me over a bridge or to the top of a promontory (Fort Greene Park is a common one for me), and I'll get to scan the borough from above, picking out the landmarks and checking the time of day on the Williamsburgh Bank Tower. It's a fun feeling to stand up high marveling down at the city, and it's one that brings most people around to the same question, whether atop a building or flying overhead: where's my house? 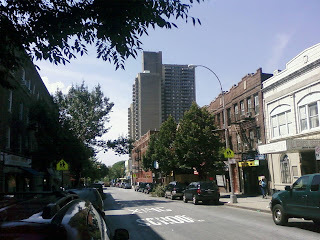 Since I live on the top floor of a three-story brownstone, I know I'm not going to see my building from any far-off lookout point, but I can always find the general location of Franklin Avenue by picking out the building above, 43 Crown Street, the tallest building in Crown Heights. At 33 stories tall, the 321-unit residential tower looms large over the rest of the low-rise neighborhood. A few 10-ish story condo units have gone up recently, and the old Jewish Hospital building is a big one, but only this concrete tower, built in 1973, has the vertical thrust to be seen from all over (I've picked it out on the Staten Island Ferry and from each of Brooklyn's East River bridges). Downtown Brooklyn notwithstanding, it's probably one of the 20 or 30 tallest buildings in the whole borough, but I can't find a list anywhere. I may regret this post, but I have to come to the defense of Nam's. After I posted about their renovations last week, I received a pair of anonymous comments with gripes about Nam's, both of which warrant frank discussion. However, there are some questions of fact that need to be addressed first. 1. Nam's is not dropping food stamps. I repeat, Nam's will continue to honor food stamps. The signs are confusing because whoever made them isn't a native speaker of English, but the issue at hand is that their food stamp machine broke and they had to mail it in to get a replacement, which ships within two weeks. I too was concerned when I saw the sign, so I asked them, and they explained that they have every intention of accepting food stamps as soon as they get their new machine. 2. "I hate Nams - they are one of a handful of local Franklin Ave establishments charging Manhattan prices." This is misleading. It would be more accurate to say that they stock some "Manhattan" goods (organic items) and charge market rates for them. They also stock fresh produce (most of which is not organic, though some packaged items, such as the pre-washed spinach, are), and with the exception of the rather meager produce racks at Fisher's and some lone items at various bodegas, they are the ONLY place that stocks fresh produce between Eastern Parkway and Atlantic Avenue on Franklin. Yoon's Market, on the other side of Eastern Parkway, is a similar business that stocks a similar amount of produce, and their prices for this produce are very similar, if not identical (this is based on prices per pound for onions, bell peppers, peaches, and plums, and prices per item for avocados, limes, and habaneros). Nam's isnt' gouging anyone with higher prices. They're just selling some expensive items. Facts are the easy part. The hard part is assessing the situation, both at Nam's and on an avenue in flux. On one hand, it's certainly fair to say that Nam's conversion to all-organic bodega is a harbinger of gentrification. These goods are aimed at a clientele that is new to the neighborhood (more on this crowd, of which I am a part, in a moment), and they cost more than their non-organic counterparts. Most of the heated exchanges I've seen at Nam's (and I've seen a few, as has the individual who made the second comment) have taken the same general form: a customer selects an organic item and is shocked by the price, often nearly double the cost of a non-organic item. The person working the register doesn't do a great job of explaining this (their English isn't great--see above), the customer, typically someone who is not new to the neighborhood or to Nam's, becomes incensed, and storms out. I am completely willing to concur that these instances, when they happen, are not good for neighborhood harmony, particularly given that the frustrated customer, whirling to stalk out, is often greeted by the faces of a handful of newbies who look a combination of confused and irked. It's hard not to draw lines in this situation, and in drawing them, to paint Nam's into the gentrifiers' corner. But that isn't the whole story, as any devotee of Nam's will tell you. Their patrons remain a genuinely mixed lot, most likely because Nam's is the sole provider of fresh produce to much of the neighborhood. The atmosphere is, overall, a friendly one, and while the bulk of what's on their shelves inside the store is organic stuff aimed at newbies, they still stalk a number of items from local Caribbean bakeries and their coolers contain plenty of "normal" drinks at "normal" bodega prices ($1.50 for a Gatorade when I got one two months ago). If the portrait painted above is the pessimist's picture, allow me to paint the optimist's: this is a place that keeps Franklin between Eastern and Atlantic from being a food desert, that brings the neighborhood together in all its diverse glory, and that introduces locals and newbies alike to new foods. I am now a proud patron of 3D's Bakery for my Hard Dough Bread, but I first picked it up at Nam's, and I know longtime residents who had never tried whole wheat pasta until they bought it at Nam's, and are now big fans. It's also locally owned and generally blends into the neighborhood, or did until they added the somewhat heinous white siding pictured above. Would it be better if Nam's was just another bodega? If you wanted (or had) to shop locally, you'd have to trek down to Yoon's or to the Associated further down for fresh produce, and most likely, the newbies would just order Fresh Direct or lug stuff from Whole Foods (where the produce is considerably more expensive than Nam's) when they visited better-off friends in Manhattan. Would near-total separation be a preferable alternative to the occasional tension Nam's unintentionally produces? Now, I know that this is a false dichotomy. My point is merely to demonstrate that Nam's isn't all bad, and that gentrification/revitalization/neighborhood change is a very complicated phenomenon in Crown Heights. This isn't Williamsburg--the residential and commercial stock are totally different, as are the location and the type of individuals moving in and moving out. I don't mean to suggest there aren't hard questions to be answered, and real losses to be incurred in any amount of neighborhood change, but I don't think Nam's is the enemy. If anything, I think a locally-owned produce shop where the business owners are savvy enough to make an adjustment that makes them unique to the neighborhood and brings a wide swath of residents through their doors is the kind of institution that suggests neighborhoods can control and participate in change, rather than just being drowned by a deluge of newcomers who build separate institutions. On the flip side, if Nam's doesn't work, or is a bad thing, what's good?